Topped with a lemony Hollandaise sauce, this variation of tofu Benedict takes its name from the aromatic, lemon-yellow blooms of the mimosa tree common throughout the French Mediterranean. 1. To make Marinated Tofu: Cut tofu slabs into rounds with knife or large biscuit cutter. Reserve tofu scraps for another use. Combine remaining ingredients in glass baking dish. Add tofu to marinade, cover, and chill overnight. 2. To make Hollandaise Sauce: Heat oil in skillet over medium heat. Sauté shallot in oil 2 to 4 minutes, or until softened. Add white wine and vinegar, and bring to a boil, stirring frequently. 3. Whisk together soymilk, cornstarch, turmeric, and bouillon cube in saucepan; warm over medium heat. Whisk soymilk mixture into shallot mixture; cook 3 to 4 minutes, or until thickened. Whisk in lemon juice, and season with salt and pepper, if desired. Keep warm. 4. To make Mimosa: Heat 1 Tbs. oil in skillet over medium heat. Add morels; cook 5 to 7 minutes, or until most of liquid has evaporated. Season with salt and pepper, if desired. Remove; keep warm. 5. Wipe out skillet; heat remaining 1 Tbs. oil in skillet over medium heat. Drain Marinated Tofu circles; sauté 3 to 4 minutes on each side, or until browned. 6. To serve: Place 1 English muffin half in center of each plate. 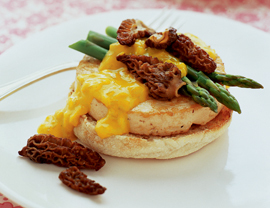 Top with Marinated Tofu circle, morels, and 3 asparagus spears. Drizzle each serving with 2 Tbs. Hollandaise Sauce. (You’ll have about 1/4 cup Hollandaise Sauce left over.) Sprinkle with chopped herbs, if using.